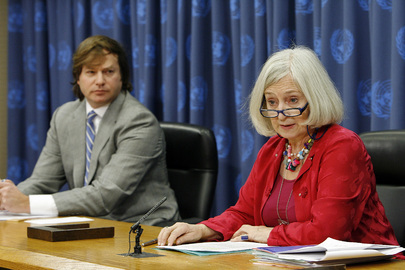 UNITED NATIONS, November 28 -- The UN's investigative and oversight chief Inga-Britt Ahlenius is being accused of systemic mismanagement and favoritism in a letter from her staff, copied to Secretary-General Ban Ki-moon and all staff of her Office of Internal Oversight Services. The letter was sent on November 26, and on November 28 in the UN's Vienna Cafe Inner City Press gave an opportunity to comment to Ms. Ahlenius, who has refused to answer questions submitted to her in August and again in October, nor to hold a press conference. Ms. Ahlenius acknowledged receiving the letter, said she had no comment but that it had been forwarded to all OIOS staff. Among the charges in the letter, which is reproduced below, is that Ms. Ahlenius bends and breaks the rules in order to put her cronies in the top investigative positions. The problem may go beyond favoritism. Corruption is allowed to flourish once an organization or department dispenses with the checks and balances of rotating people who do not know each other well into positions overseeing each other's work. This is particularly true with an agency which is supposed to be auditing and investigating a wider system, as was recently seen in exposes of the nepotism and favoritism in Citigroup's risk management department before that bank's fall. How the UN's Ban Ki-moon and his human resources officials Angela Kane and Catherine Pollard respond and move to change OIOS will be a test of their commitment to good governance. Questions have mounted about Ahlenius' terms at OIOS. A finding of corruption at the UN Pension Fund was never acted on, nor was the cover-up explained. Human Rights Watch and even the BBC have issued blistering criticism of Ahlenius' OIOS' cover-up of allegations of abuse by UN peacekeepers in the Congo. An investigative audit of the UN's $250 no-bid contract with Lockheed Martin for super camps in Darfur, which the General Assembly's Fifth (Budget) Committee demanded Ahlenius do eleven months ago has still not been completed, or at least made public. More recently the Fifth Committee has began discussing replacing Ahlenius. Some opine that the irregularities in hiring and placing Ahlenius allies throughout OIOS is an attempt to cover-up the fruits Ahlenius' untransparent reign even after she leaves. "[a]nother example of your poor leadership is the lack of your attention to management of the Investigations Division which has remained unresolved for several years now. While a temporary appointee holds the position of Director, it appears to many that he is only a "placeholder." Many believe you may be thinking of appointing the chairman of the OIOS Procurement Task Force [Robert Appleton] to this position late this year. Should this occur, OIOS staff will not be surprised if such a manipulation takes place because this pattern of ignoring United Nations established procedures has become a hallmark of your tenure as Under Secretary General. Unless a legitimate vacancy management exercise is carried out, once again OIOS will be criticized for abiding by the double standards we often criticize our clients about." That the UN system's ultimate chief of accountability would herself be so unaccountable moves irony to outrage. More than a year ago, a whistleblower in Ms. Ahlenius' unit provided Inner City Press with evidence that Ahlenius was trying to get a crony, Danielle Coolen, a job in the UN. Inner City Press gave Ahlenius a chance to comment on her e-mail, but she declined. The story was raised to Ban Ki-moon's office, but nothing was ever done. 1) OIOS' involvement in the UNIC-Toyko matters, with a shift in focus from financial improprieties exposed by Ms. Koda to a review of Ms. Koda herself, is described by some as the use of OIOS for retaliation against a whistleblower. Your response or comment? 2) Please separately confirm or deny that (a) an OIOS investigator sent to the DR Congo is alleged to have consorted with one or more prostitutes; (b) two other OIOS staffers raised this as a problem; (c) that the first investigator states that since it was only one prostitute, it is his girlfriend, and (d) that the two are now facing reviews of themselves / retaliation. 3) Regarding yourself, please deny or confirm that following recent events between yourself and a subordinate, the subordinate was paid to leave the OIOS position in view of "harassment." 4) Please provide some update or statement regarding the status and findings of the review of the PAE/Lockheed Martin contract in Darfur which the General Assembly in December 2007 directed OIOS to carry out. If you wish, please describe any actions you have taken on the Grimstad reports / your documents. Ms. Ahlenius -- Now that you will be reporting to the Fifth Committee, and will presumably thereafter finally appear at a press briefing in Room 226, please belatedly response to the four questions below which were sent to you more than five weeks ago. While the first question is partially answered by Paragraph 40 of your Report, the others remain unanswered. Additionally, in connection with applications to become deputy director of OIOS' investigations division, please describe all of your and OIOS' knowledge of actions taken by Mr. Florin Postica and Mr. Vladislav Guerassev with regard to co-applicant Andreas Mlitzke and access to his UN personnel file. Finally, for now, please state when you will be appearing for a press briefing in Room 226. It is with regret that we have to write this letter to you and that it is anonymous. However, the situation in our Office has deteriorated to the point where we fear to bring forward many of the issues that affect us. The absence of open communications between the staff and you and our fear of retaliation have forced us to appeal directly to you. Other channels are open but we believe it is best to take a direct approach first and resort to other approaches as they become necessary. We are concerned with the issue of senior post selection within OIOS which has caused a severe, repeat severe, succession planning crisis within OIOS at the most senior levels. For the past three years now, very little has been done to recruit, select and assign staff to senior management positions and “to limit temporary assignments to vacant posts to the shortest possible period, during which time the post must be filled under the procedures of (this) instruction (ST/AI/2006/3)”. Specifically, we are concerned that several high level posts in OIOS inter alia the Director of the Investigations Division, the Director of the Inspections and Evaluation Division and the OIOS Executive Officer have been encumbered by temporary, acting officers for extremely lengthy periods of time and have not been advertised nor filled in accordance with standard practice. In addition, the Director of the Internal Audit Division is approaching retirement this month. Contractual extensions of staff who reach the mandatory retirement age as required by the General Assembly should not be the subject of extension unless specific criteria are met. We are concerned that timely issuance of vacancy announcements, especially for staff members who are required to retire, are not being advertised far enough in advance and thus little succession planning occurs resulting in contrived reasoning and rationale for the extensions. Obviously this has a negative effect upon the career progression of serving staff. It is thus extremely likely that all three of the directorships within OIOS will be officially vacant as of 1 December 2008 and once again OIOS will revert to temporary filling of the IAD Director’s post either by improper extension of the current manager or by another temporary appointment! The extension of staff beyond the mandatory age of retirement is an example of poor leadership, lack of planning and a fear of failure. It is both disappointing and discouraging that you, as our manager, pay so little attention to governance issues such as succession planning within your own Office. In the case of the IAD, an extension of the current Director would make a mockery out of the vacancy management exercise which was supposed to occur when the post was advertised last summer. The personal circumstances which have taken place in the last few months have destroyed the IAD Director’s reputation and made him appear a fool to many of us. For the past year his absence on unnecessary and costly official business to the far corners of the world has not been in the best interest of OIOS or of the United Nations. A recent example is his recent trip to Nairobi to attend a “retreat” by that small unit accompanied by the Deputy Director. In this time of world economic crisis, this exorbitant spending is absolutely in bad judgment and a bad example for us as serving staff who know it is wrong. The IAD director’s eventual succession by the current Deputy Director, which is widely expected due to signals received by yourself in the last few months, is not acceptable to most serving staff and would seem to reward the overt favoritism and abuse of authority she has displayed with some subordinates. Of particular concern is the favouritism shown with respect to a particular subordinate with whom she resides. This particular situation, which has not been corrected by you, has gone on during your entire tenure and makes OIOS look ridiculous since it flaunts the very United Nations regulations and rules the Office tries to uphold. Please expect staff to register a “no confidence” vote in your leadership should the Deputy Director ever be appointed as Director. This choice would be absolutely unacceptable to us. In addition, your choice of the Director in the IAD Geneva Office is another embarrassment to your leadership and requires investigation. His recruitment and continued employment in OIOS (he turned 62 years old last April!) mocks us all as OIOS staff and sets a double standard we are all ashamed of. It is time for him to conclude his brief United Nations career before the scandal of his appointment and his age become public knowledge. The Report of the Advisory Committee on Administrative and Budgetary Questions of 6 November 2008 notes that staff members were often extended beyond mandatory retirement age pending recruitment of a replacement and that this situation can and should be avoided (A/63/526 refers). Does this not apply to OIOS? It is time that the accountability of your decisions receives attention. Another example of your poor leadership is the lack of your attention to management of the Investigations Division which has remained unresolved for several years now. While a temporary appointee holds the position of Director, it appears to many that he is only a “placeholder”. Many believe you may be thinking of appointing the chairman of the OIOS Procurement Task Force [Robet Appleton] to this position late this year. Should this occur, OIOS staff will not be surprised if such a manipulation takes place because this pattern of ignoring United Nations established procedures has become a hallmark of your tenure as Under-Secretary-General. Unless a legitimate vacancy management exercise is carried out, once again OIOS will be criticized for abiding by the double standards we often criticize our clients about. Of great concern is the use of temporary replacements in OIOS. This has had a negative effect on staff morale due to the backlog of promotion prospects created when staff members are placed on temporary posts with Special Post Allowance (SPA) for prolonged periods. This affects staff all the way down the line and freezes staff in temporary posts for long period s. Staff members serving on SPA may have been given the false impression that temporary assignments on SPA provide an advantage to eventual promotion to that particular post. However this is false and should not happen if posts are advertised and filled without unnecessary delay. Temporary assignments on SPA provide an unfair advantage to incumbents in eventual vacancy management exercises and seriously damage the full and fair right of other staff members, both within OIOS and in the Secretariat, to due process in promotion exercises. Temporary assignments longer than three months to higher level posts as indicated in ST/AI/1999/17 should be viewed as detrimental to the transparency of the established vacancy management process within OIOS and in larger sense, the United Nations Secretariat. The General Assembly concurred some years ago and issued GA resolution A/Res/51/226. It is totally unacceptable that OIOS does not abide by the voice of the Member States and your tenure is remarkable in its lack of attention to this voice. We respectfully request that you, as the USG of OIOS, address these issues immediately by conforming to standard procedures in OIOS staff selection processes. You should be at least aware of the expressed desire of Member States and relevant resolutions and should show staff true professionalism and leadership in human resources management and succession planning in OIOS. As a start, improvement on communications with staff on progress taken to advertise and fill senior vacancies within OIOS should take place as soon as possible. We plead with you to address these concerns without delay since we intend to pursue them at the highest levels and apply pressure as required so that reform and change takes place. We will continue to follow this story. In fairness, perhaps despite the series of non-answers, evasions and press non-availabilities, Ms. Ahlenius has answers to these questions. If ever they are provided, they will be reported on this site.